When Michael Hofmann and James Lasdun's ground-breaking anthology After Ovid (also Faber) was published in 1995, Hughes's three contributions to the collective effort were nominated by most critics as outstanding. He had shown that rare translator's gift for providing not just an accurate account of the original, but one so thoroughly imbued with his own qualities that it was as if Latin and English poet were somehow the same person. 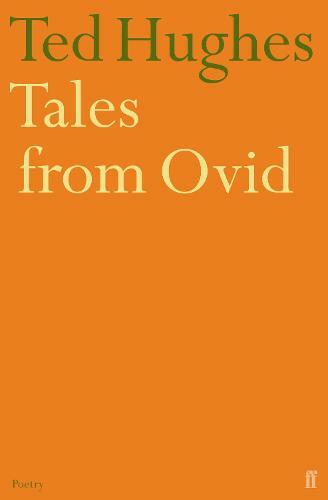 Tales from Ovid, which went on to win the Whitbread Prize for Poetry, continued the project of recreation with 24 passages, including the stories of Phaeton, Actaeon, Echo and Narcissus, Procne, Midas and Pyramus and Thisbe. In them, Hughes's supreme narrative and poetic skills combine to produce a book that stands, alongside his Crow and Gaudete, as an inspired addition to the myth-making of our time. "Brilliantly succeeds at bringing Ovid's passionate and disturbing stories to life." --James Shapiro, " The New York Times Book Review"
"One of the few unquestionable successes in the revolutionary vein Pound opened at the start of the century." --Donald Lyons, "The Wall Street Journal"
Primarily recognised as a poet, Edward (“Ted”) Hughes was one of the most important and influential writers of the Twentieth Century and a former Poet Laureate. He is remembered for collections including Crow and Remains of Elmet as well as Birthday Letters, his late record of his tempestuous marriage to fellow poet Sylvia Plath, and his children’s fable The Iron Man.